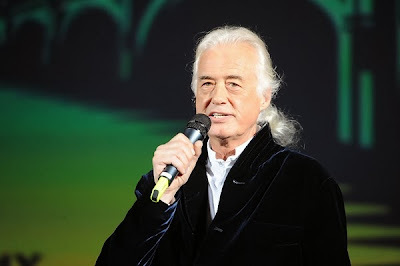 WJSG Internet Radio: Jimmy Page Mashes Up Led Zeppelin and Notorious B.I.G. Jimmy Page Mashes Up Led Zeppelin and Notorious B.I.G. Who knew Jimmy Page was a hip-hop head? The legendary Led Zeppelin guitarist has shared an unlikely mash-up track called "Ramblize," which blends his former band's hard-rock anthem "Ramble On" with the Notorious B.I.G. 's rap staple "Hypnotize." While this might sound like a bizarre prank, the track is currently streaming at Page's official website. A link to the track was tweeted out yesterday morning, accompanied by the prophetic phrase, "On this day Biggie Smalls." "Ramblize" features Biggie rapping his iconic "Hypnotize" verses over a sampled beat, random DJ scratches and various elements (the bassline, acoustic riff and twitchy percussion) from "Ramble On." Meanwhile, bits of Robert Plant's lead vocal ("I smell the rain!") randomly drift through the mix. While it's a bit surreal hearing Biggie rap about "bulletproof glass tints" and "every cutie wit' a booty" over a hard-rock classic, the two disparate halves form a strangely cohesive whole. In less-quirky Led Zeppelin news, Page is still planning extensive remasters of the band's discography, which will hopefully include a number of unheard "hidden gems." "The catalog was last remastered 20 years ago," Page told Rolling Stone last year. "That's a long time. Everything is being transferred from analog to a higher-resolution digital format. That's one of the problems with the Zeppelin stuff. It sounds ridiculous on MP3. You can't hear what's there properly." Page also promised that the reissues would include "the substantial stuff" left on the cutting room floor, including "different versions of things, different approaches to the mixes."